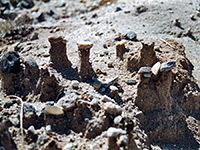 The Borrego Badlands are a vast region of mud, clay and sandstone hills in the northeast of Anza-Borrego Desert State Park, and may be viewed from a distance along parts of the two main roads S22 and CA 78, but for a close-up look, the shortest route is the Thimble Trail - 2 miles to the edge of the formations or 3.5 miles to Mal Pais Vista, an elevated, more central viewpoint. The trail is actually a vehicle track, mostly flat though not suitable for 2WD cars as some parts have soft sand, including one section up a steepish ridge quite near the start. 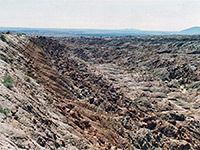 Panorama of the Borrego Badlands. 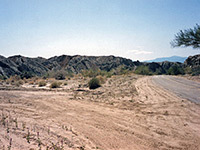 The trail begins along S22 (south side), 14.5 miles west of Hwy 86 in Salton City, and is marked by a small sign. Non 4WD vehicles may be left at a small parking area by the main road. A round trip walk to the first overlook takes about 2.5 hours, across gently rolling ground mostly covered in whitish sand with just a few exposed rocks and not much vegetation - landscape on a rather smaller scale than the grand Santa Rosa Mountains that rise sharply to the north. After 2 miles, the track divides at a T junction; straight ahead the land rises to a low ridge, far side of which stretch the barren hills and ravines of the badlands - a great expanse of grey, red, black and brown colored earth. Mal Pais Vista is reached by following the left fork of the track, right at another junction after 1 mile then a little way further to the roads end. The other branch eventually returns to the highway, after one more junction with a track to Fonts Point, another high promontory overlooking the badlands.